Welcome to the Rosemary Douglas MBS Fair at NANTWICH. 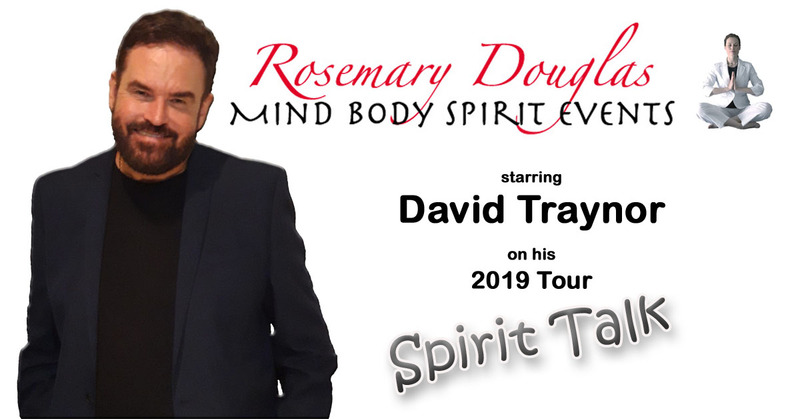 Come join Spirit Medium David Traynor at the Rosemary Douglas Mind Body Spirit Fair at Nantwich Civic Hall where David will be doing 121 Readings on both the Saturday and Sunday between 10am and 4pm. Your appointment time will be confirmed by TEXT and pre-payment will be required. By joining David Traynor at this MBS Fair you can take advantage of seeing his FREE demonstration of Clairvoyance @ 5.00pm and also the many other Talks and Shows being offered throughout the day. A nominal entry fee will need to be paid to access the MBS Fair which can be bought in advance via Ticket Link. Come join us for a FREE 1 hour long demonstration of clairvoyance by Spirit Medium David Traynor @ 5.00pm . A fantastic insight into communication with the Afterlife through this audience participation demonstration where Spirit Medium David Traynor will show you that our loved ones continue to watch over us. This is a FREE demonstration, no ticket required once you have entered the Rosemary Douglas MBS Fair. Tickets for access to the Main Event are available online using the Ticket Link.